The Adult Bunny Shoes are a cozy way to walk around this year! If you're looking for a way to give your rabbit costume the complete look, these bunny shoes are the perfect idea. 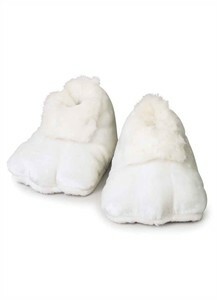 Or use these around the house as bunny slippers. Either way, you'll be super warm, and comfy in these soft shoes. Give yourself a little extra luck this Halloween by having more than just one rabbit's foot! Availability The Adult Bunny Shoes ship in approximately 1 business day.